Engineer Lehodi Seoka took top honours at the first quarterfinals of the Dis-Chem Brain of 702 at Maponya Mall. He managed to answer a total of fifteen out of nineteen questions correct and walked away with a whopping R5 000 cash prize. Lehodi was definitely determined to claim this victory and said he had been training for this moment his entire life. The mall activation proved nothing less than exhilarating for spectators, players and even the judges. It was a fun-filled event and spectators and contestants got to meet their favourite 702 presenters. 702's Relebogile Mabotja and Gushwell Brooks were the overall judges making sure no stone was left unturned in the attempt to crown the ultimate fact fanatic from the week. Lehodi along with four other contestants were given 90 seconds to answer a train of 25 questions from quiz-master Eusebius McKaiser. The annual competition gives those with a brilliant bank of general knowledge a chance to cash in and show off, both on-air and in front of a live audience at the weekly mall activations. The talented Engineer beat Information Design student Sinoxolo Xama, Office Manager Lynne Hanley, Pharmacist Mayshree Rowjee and Property Specialist Conrad Chorumanail-biting round. Click here to find out when we'll be at a mall near you or if you think you have what it takes, register to possibly become a Dis-Chem Brain of 702 contestant on air. This is your year to make your mark in business. Find the perfect broadband Business Internet solution for your business. Themed “building a local economy that grows in the hands of the people” Masina delivered his state of the city address in Ekurhuleni today. Sandton City was home to the fiercest battle as our fact fanatics battled it out for the Brain of 702 title. 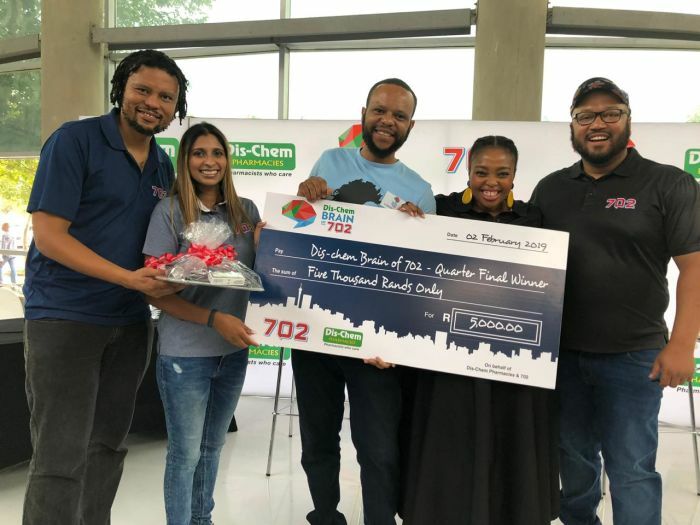 The 27-year-old governance and compliance practitioner walked away with R5000 and secured his spot in the Dis-Chem Brain of 702 semi-finals taking place next weekend. From wildcard to winner! After replacing a finalist who couldn't make it, Sean got super lucky and actually won!